1 2 3 4 5 Click to share your rating 33 ratings (4.1/5.0 average) Thanks for your vote! "Good, but not "Original Trilogy good""
Set between Episodes II (the awful “Attack of the Clones”) and III (the overly-dramatic “Revenge of the Sith”), this film tells the tale of what Anakin and Obi-Wan got up to during the Clone Wars. Unfortunately, like all the new trilogy, it doesn't quite live up to the standards set by Episodes IV-VI. Done entirely in CGI (so at least the visuals match the acting now) – Lucas still can't help but throw in cutesy characters (though fortunately, Jar Jar doesn't make an appearance), or a daft plot – the characters look very much like their live action equivalents (only Christopher Lee, Samuel L. Jackson, and Anthony Daniels reprise their roles). There are good combat scenes, and some new vehicles, and the signature vertiginous drops that appear in all the movies. There's no opening crawl, though – a glaring omission. All-in-all, it's a fun 100 minutes, but don't expect it to be the best Star Wars movie ever (though I thought it better than Episode II). "Not the Best - But Great Animations"
I am a little disappointing by movie, I was let down by the introduction of a Padawan and thought that it would tie more into the original Clone Wars Series. I enjoyed the Animation though. I have also enjoyed watching the TV Series and will most probably purchase this when it comes out. Overall the TV Series has grown on me so am looking forward to watching this movie again and again. "Clone Wars, The New Hope"
Remember when you first saw a Star Wars movie? The excitement & wonder of it all? 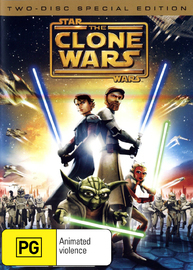 If you want to experience that feeling again, get ‘Clone Wars’. Amazing animation and great story make this a welcome addition to the SW universe.If you found the recent prequels a little disappointing I think you will be pleasantly surprised with ‘Clone Wars’. And the best bit is that there is a TV series on the way. Highly recommended for fans & general viewers alike.